Stretched canvas prints are ideal for decoration, as gifts, for archival purposes, and for exhibits! Our stretched canvas prints have been ordered by artists featured in nationally renowned art galleries and museums. Be sure you choose a design you like, as with proper care, these prints will last you a long, long time. Our stretched canvas products use artist-quality canvas wrapped around a sturdy, 1.5” thick wooden frame, with your choice of gallery or museum wrapping. We use eco-friendly, soy-based inks that offer UV protection and superior lightfastness. 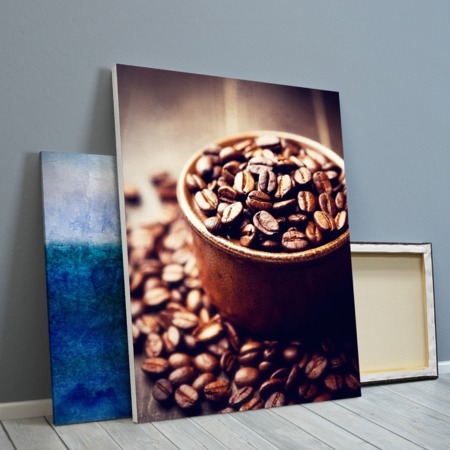 All stretched canvas prints feature a satin coating to prevent cracking and damage due to moisture, keeping your prints safe and looking great for years to come. Stretched canvas prints have a standard printing turnaround time of 3 business days, which is more competitive than the industry standard. Please consider turnaround times and order quantities if you need your prints by a specific date. That way not only do you get great looking prints, you can save time and money as well!